Jonathan Shiflett has been working in the legislature since 2011 and has worked in both chambers. 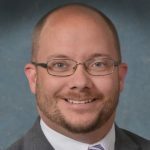 He is currently working in the Senate Majority Policy Office as a Policy Advisor for the Judiciary Committee, and the Appropriations Subcommittees for Corrections and the Judiciary. Jon received a B.A. from Michigan State University and a Juris Doctor from Thomas M. Cooley School of Law. During his education Jon completed internships in the Michigan House of Representatives, U.S. House of Representatives, and the Washtenaw County Office of Public Defender. Prior to undergraduate work,Add New he served four years in the United States Marine Corps. Jon lives in Grand Ledge, Michigan with his wife, daughter, and pets. In his spare time, he enjoys gardening, home brewing, and cooking.